Well the old knife block had all it could take. The new one is maple with a little figure. Mitered joints with splines for added strength. Stain, poly and wax. We’ll just have to see how long this one lasts. Thanks for looking. Looks great Dan. Countertop worthy indeed. Very cool! Same thing just happened to me. I need to make another one but I’m going to go with a shallower angle. Everyone complains about there not being enough room under the cabinets. looks great, really like the ‘dark’ sticks you used, got a source for those? Very nice, Dan !!! I can’t tell from the picture how the knives are being held. I noticed that Ned mentioned “sticks”. Am I looking at dyed bamboo skewers? NebB and John, the inside is from the old block. Its plastic rods are packed tight in a plastic block, like a whisk broom. The rods hold the knives. We just have to make sure not to over load the block this time. I’ll get a closer shot for you. I hope this picture explains the inside a little better. Now I get it. Thanks, Dan! 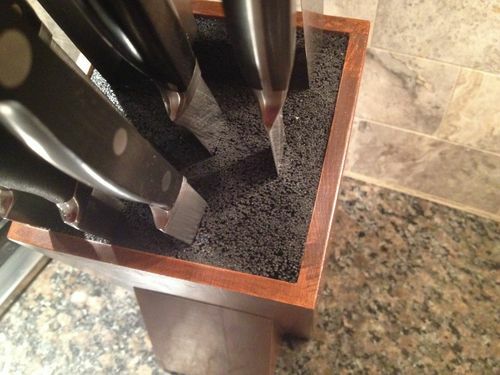 I saw a similar knife holder by Chris Schwarz at PopWood where he used a bazillion bamboo skewers. Thought you might have used the same technique. Very Nice indeed Dan! Thanks For Sharing! That’s pretty awesome! I’d love to see how you put this together. I’m right down the way in Addison.